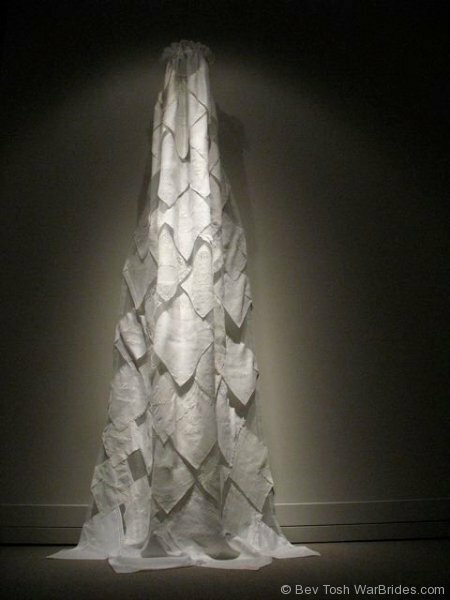 This ephemeral bridal veil is made of vintage handkerchiefs, each embroidered with the name of a “bride ship,” the term used for the troopships that carried the war brides and their children. 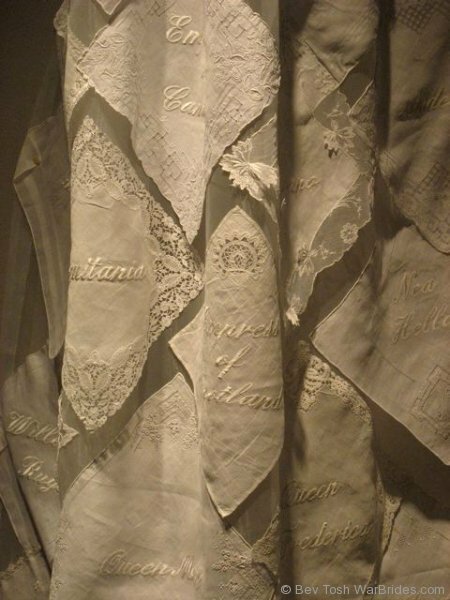 The handkerchiefs are symbolic of tears. 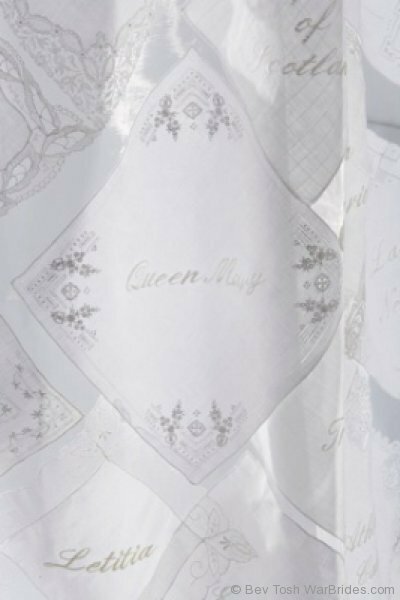 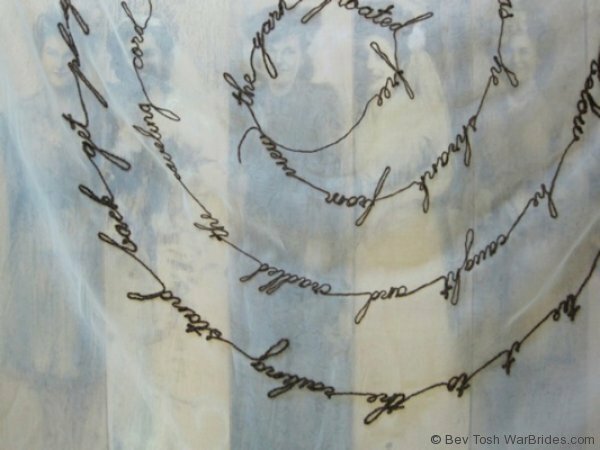 They also recall an image of departing war brides evoked in a 1946 letter, “ … Along the entire main deck of the ship the handkerchiefs fluttered in an unbroken line, like washing day in Manchester or Leeds…” The veil is gathered onto an embroidery hoop in keeping with the tradition of women’s handiwork. 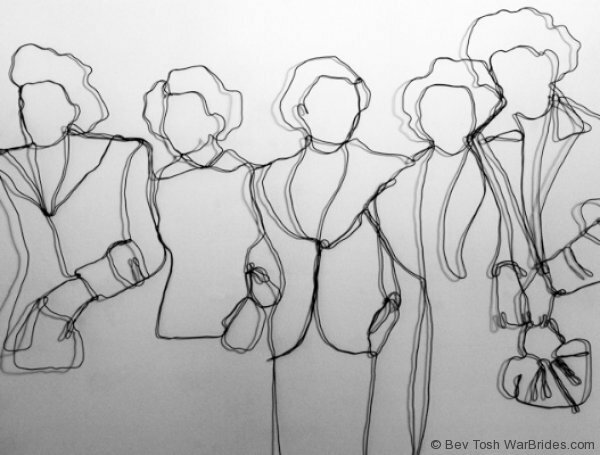 Steel wire, 10 feet long by 50 inches high, 2011, links 15 Canadian women on the deck of their bride ship, the SS Monterey, bound for Australia in 1946. 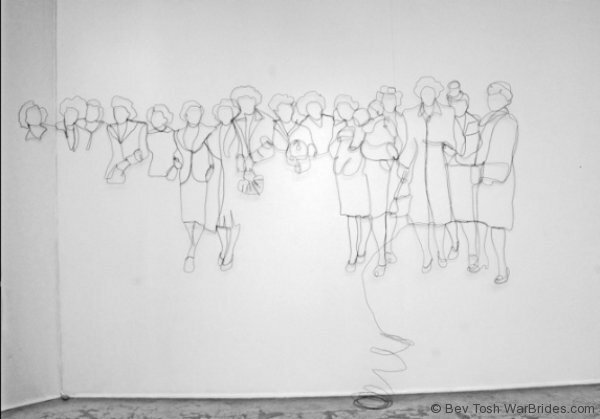 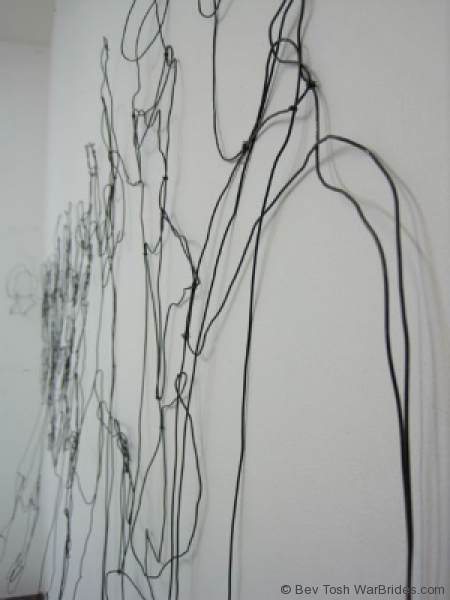 Formed of one continuous length of wire, this “drawing” implies that we are molded and defined by those who stand beside – and lean against – each of us. 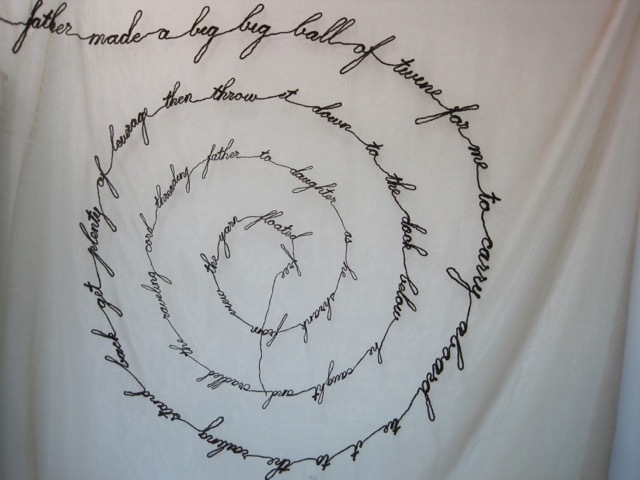 Lifeline, twine on textile, 11 feet square (overall), 2010, speaks of leaving family and country. 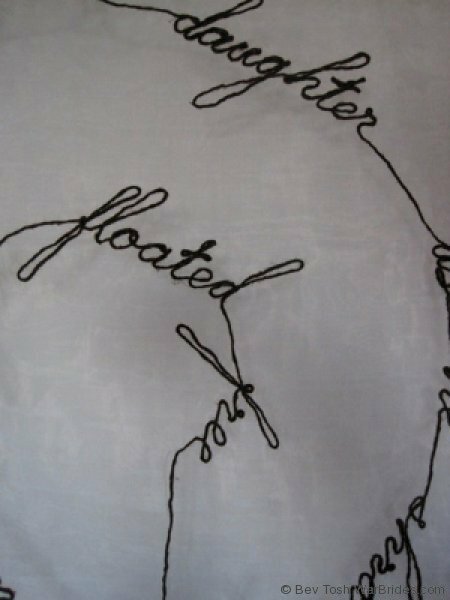 It is based on Reta’s fading memory of leaving her Australian home in 1946 en route to the United States as a young war bride. 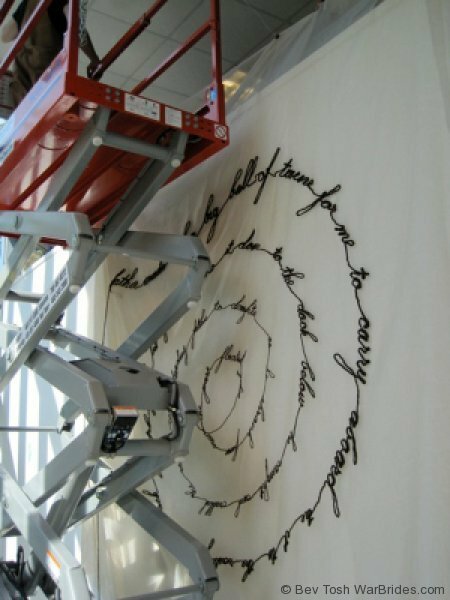 In stitching the words of her story, I was able to pick up threads of her memory and form them into a koru (Maori motif for regeneration).